It was some miles into the mountains east of Briançon at the summit of yet another pass where we said good-bye to the French Alps and our alpine experience took on an Italian flare. As always, crossing the barely marked border between France and Italy triggered an onslaught of changes. The first of course was the language, which was a welcome though awkward transition. An hour into Italy Bill called to make reservations for the night and his French, English, and German words were too eager to help as he struggled to construct a few sentences in Italian. The host was patient through the multilingual barrage and finally put his English speaking son on the line. Time to try out our new 3.5" diameter ping pong paddles. Being able to make the call for reservations on our cell phone was in itself a monumental and much anticipated change. France is one of the few European countries in which the pricing structure for cell phone use is prohibitively expensive for us. After months of cell phone use in 2008, we had to curtail it while in France. But as soon as we crossed the border our Italian SIM cards were popped in, the phones were turned on, and we felt like fully enfranchised adults. Later that afternoon a visit to a phone shop would enable Bill to reactivate our internet connection via cell phone service and we were again online at will. Crossing any border means big changes in our food-related activities. Where in town we looked for the markets was the first difference to which we had to adjust and then it was shifting what we expected to find on the shelves. The bulgur we prefer for breakfast would disappear while in Northern Italy as would those lovely prepackaged carrot and beet salads. But the prices on food would plummet and the availability of nice pesto sauces would increase. And Bill could hardly wait for his first real Italian cappuccino, whether it was one he made himself or a cup he was served. The increase in the price of lodging would be more than we'd save on food but we'd happily pay the difference for the boost in comfort and quality. Our first night's stay in Italy was in the small town of Susa and riding in its river valley felt so familiar even though we never had been there before. 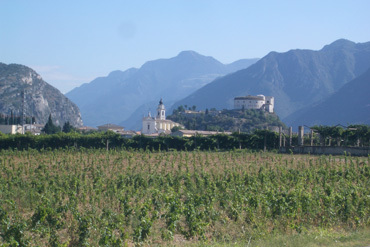 Bill knew why: Valle di Susa was only a day's ride south of Valle d'Aosta where we spent so much time in 2006. The land forms were similar as were the old hilltop sentinel castles and the vegetation. Being in this northern Italian valley felt like yet another home coming. But we had little time to linger in these welcoming western Italian mountains and Bill's route once again guided us into the Po River valley. We were heading for Torino (Turin), the site of the 2006 Winter Olympics, so as to catch a train to more eastern Verona. At the end of the week we'd need to collect the keys to our tourist apartment in the Dolomites and the Po Valley was perfect place to pick up speed. 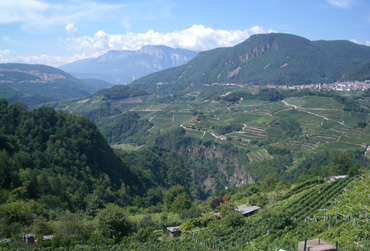 Riding was easy through the Adige River vineyards. Torino is a lovely city with a delightful Egyptian museum we've visited twice but we settled for the scenery around the train station, as we did in Verona on the other side of the Po Valley. Like Torino, we'd also visited Verona in the past and so made do with the memory jogs provided by its fine 1st century ce Roman amphitheatre in the center of town. It was the right trade-off: whiz across the more polluted Po Valley by train and then slow down the pace as we made our approach into the mountains. Verona, with its quarter of a million people, and Trento with about 110,000 people, were the the last cities we'd see for a month or more as we traveled farther north along the Adige River. After these cities, our host locations would be villages of a few thousand or less. But Bill had limited success in buying the maps he would need over the next few weeks in these cities. The pressure had been on as we knew we'd meet resource constrictions in the smaller communities ahead. We'd each been stocking up as we could on inventory for the stay in the mountains, things like maps and favorite brands of sunscreen that aren't always available. We were huffing & puffing in the upper valleys above the river. Riding north along the Adige River which linked the cities and then beyond its banks also triggered another batch of delightful memories. We'd pedaled along the river several times in the past but only retraced a few of our tracks. There were new bike routes and old routes that were new to us that pulled us off the busy roads, both of which fostered turning our attention to the emerging mountain scenery. The warm weather and brilliant skies heightened the idyllic experience of riding through vineyards and orchards of apples, pears, and kiwis. 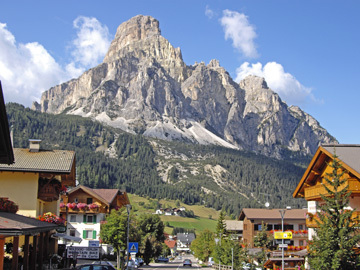 And it was even more exciting when after Trento we entered a series of increasingly higher valleys: Val di Fiemme, Val di Fassa, and finally our destination, Val Gardena. Over the course of a few days we'd travel from near seal level to almost 5,000' as the mountains became higher and the valleys more narrow. The truck traffic was intense as important porphyry quarries lined sections of our steadily higher road but the quarry operations added to the interest of the journey. In the past we'd made our approach to the mountains on the more western side of the valleys; this time we were on the more shaded eastern side. Such small changes in route have big impacts on the experience and being on this road for the first time put the adventure back in a familiar experience. 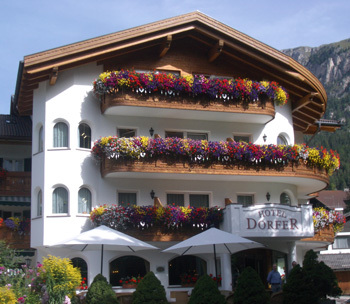 Ah, walking into our hillside tourist apartment for the second year felt like another home coming. The cheery proprietress greeted us like long lost friends and everything at the fully furnished apartment was in order. Unlike our usual one-room configurations, we had separate bedroom and a living/dining room, both of which opened out onto a large balcony. The apartment was nicely appointed and the tiny, separate kitchen well equipped--all we had to do was provide the toilet paper and detergent. Ah, back to charming Selva for 2 weeks. The apartment's large bathtub was a treat, as well as the no-charge washing machine down the hall. We had CNN on the TV to get us caught up on the news and high speed internet service for cell phone users had recently arrived in the valley. All the comforts of home with none of the responsibility--what could be better? We quickly decided that our first days in Selva would be on an alternating "hard-easy" schedule. 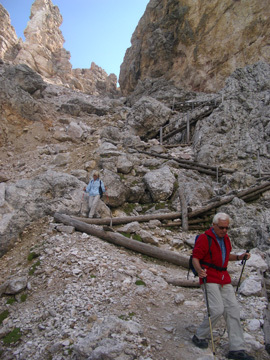 The hard days would be those 6+ hour outings of hiking beyond Selva village where we'd use a bus or cable car for a part of the journey and perhaps include a Via Ferrata (more dangerous trails made safer with steel cables). The next day, an easy day, would be a 2+ hour walk on one of the many trails starting from our neighborhood. Though we quickly learned that it was as simple to pick-up 600-1000' in elevation gain on an easy day as it was a hard day because the Selva slopes are so steep. A string of problems soon ensured that the hard-easy routine wouldn't be the rhythm for only our first days in Selva but likely for our entire 2 week stay. And soon another less welcome rhythm manifested, which was splitting up for separate activities on the easy days to maximize the use of our computer. Ooops! 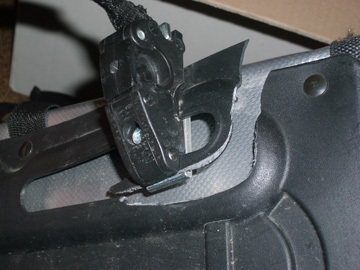 No repairing this pannier mounting bracket. The problems began in the first minutes after arriving at our apartment. Bill removed 1 pannier from his bike in the garage and discovered that it had barely been attached to his rack: he had flown down to the village from Passo del Sella with a shattered plastic backing on the pannier mounting bracket. At first look we thought a couple of bolts would hold things together but closer inspection revealed that it wasn't salvageable. His scrutinizing of his other pannier once in the apartment revealed that it was in the early stage of a similar demise. We knew from prior pannier problems in the Dolomites some years ago that no comparable product was available in the region. Last time buying a good pannier set would have required taking a couple of days to travel by train into Germany to shop--travel that in itself would cost more than the $100+ of the panniers. After much brainstorming late on this Saturday afternoon, a little online research, and a phone call, the disintegrating panniers would be on their way to Düsseldorf on Monday morning. That's where we'd purchased the panniers in February and luckily Bill still had the name and number of the clerk who helped us then. The clerk would exchange the panniers under the 2 year manufacturer's warranty. Taking a few more hours out from hiking to find a shipping box, buying packaging tape, and visiting the post office looked like a good trade-off. In the process of problem-solving the pannier problem, our laptop's recently wobbly performance looked ready to take a precipitous drop. It was now crashing multiple times a day and reviving it was taking increasing drastic measures. In our first hours in Selva while Bill was arranging to have his panniers replaced, we decided that solving the computer problems needed to move to the top of the list. Hiking in the mountains kept being shoved lower down on the priority list. Bill getting his mind off the computer hassles. Our laptop's increasingly bad behavior appeared to be due to a minimum of 3 problems--probably all hardware--and we wondered how much longer it would function. The pressure was on to get as caught up as possible on webpage journals, photo culling, and other chores before it crashed for the last time. So instead of going for walks together on the easy days, we kept separate schedules for our entire Selva stay. On our easy days, Bill would crank up the computer before breakfast and work on it all morning while I went out for my local fitness walk and bought groceries. We'd have lunch together in our apartment and then it was my turn at the computer while Bill went out for a change in scenery. Bill would usually take the computer back in the late afternoon and I'd do some last work for the day while he soaked in the tub or planned the following day's big hike. During the first week in Selva, many of Bill's hours were spent running diagnostic tests and talking to Dell technicians about the various problems we were having. Fortunately our friend Mulvey from Portland suddenly decided to visit us in the Dolomites and he was kind enough to bring the replacement chip that Dell mailed to Bill's sister. It was incredibly lucky timing though it put the pressure on Bill for days to get the troubleshooting to that point of clarity. We hoped the laptop would hang in there for the almost 2 week wait for the chip. And if it wasn't one thing, it was another. We'd packed a box with our Via Ferrata climbing gear before we left the States and had it sent to us in Selva. It arrived without a hitch and in it was also a new camera Bill had ordered when our 5 year old camera jammed way back in Cefalu, Sicily. We were able to get the old camera working again while in Sicily but decided to buy a replacement for it after the first shot across the bow. On a lark, we decided to take paired photos with the new and old cameras. Incredibly when Bill displayed the pictures on a split screen, the new camera's offering was almost always the worst of the 2. During his walks to take a break from the computer troubleshooting Bill would take yet another set of paired photos after fiddling with the settings on the new camera. We didn't know if the dealer would take the camera back after so many months but researching that would have to wait. A week into problem solving the computer Bill was still at the "2 steps forward, 1 back" stage. The 2 new software packages of back-up systems he was installing presented him with a pile of new problems to solve and putting in place an easy, almost continuously back-up system had become a top priority as we were cranking out volumes of work on an unstable machine. 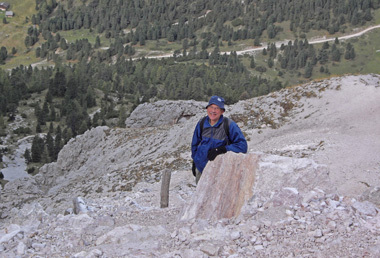 I didn't help matters either when I lost our 10 year old altimeter when out on one of my in-Selva hikes. I discovered it had "gone missing" from its carabineer on the back of my pack an hour and a half into my outing and I spent the next hour and a half retracing my steps instead of eating lunch as planned. Bill immediately began looking on the internet for replacement models and was horrified to discover that the newer versions were much less suited to our needs. Potentially precious time working on the computer problems was diverted to the altimeter replacement as there would still be time to call our friend Mulvey and ask him to bring us a new one from the States, especially since a quick shopping trip in Selva revealed that no altimeters were available in town. We didn't need GPS for this part of the trail. Fortunately, my last ditch effort to retrieve our altimeter was fruitful. After discovering that Selva lacked a functioning lost-and-found service I decided to inquire at the hotel closest to one of the 3 mostly likely spots were I could have lost the altimeter. I was pooped from my hours of walking and Bill kindly included a trip to the targeted hotel in his afternoon break. Indeed it had been turned in there and the whole event only cost us the better part of an afternoon. Bill's disappointments and challenges were amplified when a high mountain hike early in our stay revealed that his GPS system wasn't accurate enough for locating difficult to find trails. That meant interspersing more hours of problem solving yet another system with the computer issues to get the GPS functioning at a higher level. Yes, we've noticed a theme: most of our problems this year were with electronics but we haven't figured out what to do with that awareness. The only good news from our troubles were the new options Bill discovered for backing up our computer. Since it was crashing often and was resistant to recovering, finding slicker ways to back-up seemed our best defense. Of course the research and implementation took hours but we were both relieved to at last have new solutions to this always nettlesome problem that would result in fewer losses if it finally failed to recover from a crash. 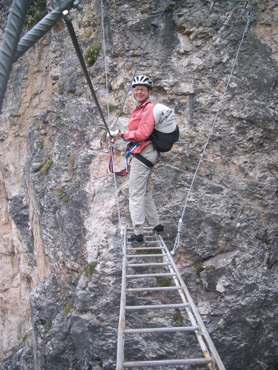 No chatting on this part of the Via Ferrata. It didn't take getting all the way to Selva to validate our earlier assessment: for us the Pyrenees were just another mountain range and the Dolomites are simply amazing. 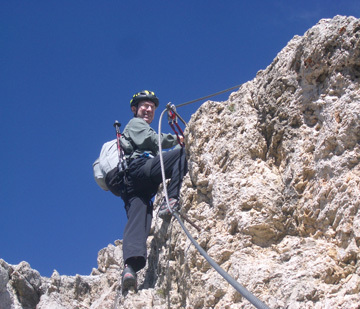 A couple of days after arriving in Selva we were sharing a dicey Via Ferrata wire with a lifelong Colorado resident who was having her first experience in the Dolomites. Chatting with her reminded me of a fellow cyclist who had asked several years ago if his Colorado Rockies weren't just as grand as the Dolomites. Having only driven through the Rockies 30 years prior, I was in no position to make a comparison. 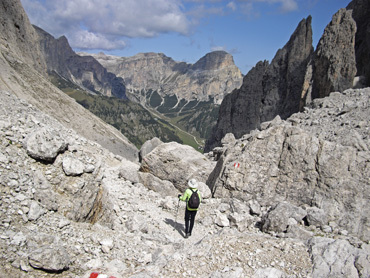 So I jumped at the chance to ask the opinion of this trail runner from Colorado and she was quite clear: despite loving her Rockies' peaks, she also felt the Dolomites took the prize for most awesome mountains anywhere. We compared notes with the Coloradoan and we all agreed that it was the immediacy of these sheer-faced mountains that made them so compelling. They literally surge a thousand or two feet up from your toes like a sea monster arising from the depths. So many mountains are cones or clusters of cones with broad bases and far-away peaks but not these mountains. It's stunning to stand against one of these faces with a hand on it and see it rise straight up from there. This surging straight-up quality in the Dolomites means that a peak across the valley from where you are standing might be less than a mile away. The immediacy and the variety of the forms and colors makes the Dolomites a delight to look at and walk among. And it is the extensive infrastructure provided by the of network of ski resorts in and around them that makes them so accessible for hikers. 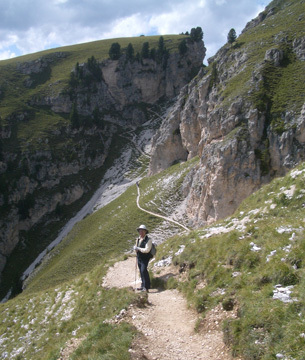 Unlike the Pyrenees and our mountain trails at home, one can access hundreds of hiking trails without having a car when in the Dolomites. Dozens of cable cars operate in the summer to deliver hikers to high starting points for their walks and buses link the villages in the mountain valleys. We've yet to see another area offering such an assortment of day hiking opportunities. We haven't found anything quite like the Dolomites. Our friend Mulvey who arrived in Selva at the end of our stay and who is in ongoing raptures about his experiences in Pakistan and the Himalayas also concurred that the Dolomites are in a class of their own. Yes, the Himalayas are much, much higher but he too raved about the closeness of these sheer gray rock headwalls juxtaposed with the lush green mountain meadows and conifer forests. And he too was dazzled by the ease of access to the many interlinking trails from the cable cars and buses. Our 3+ weeks in the Dolomites flew by. We wished that the weather had been warmer and drier than it was but it had been a cool, wet summer season even before we arrived--it even snowed in the peak of the August high season. But the rains didn't ground us and we enjoyed our mountain hikes and village walks and slipped in some Via Ferrata adventures on the dry days. Our long stay in Selva was a nice interlude for us as we so often are in a new room every night. Packing up nearly every morning is one of the most tedious aspects of our lifestyle and we enjoyed the mid-season break from that routine. Living out of drawers and closets instead of panniers was a welcome change too. Having everything completely unpacked created a needed opportunity for culling our gear for the last 100 days of our travels. In the process some things would get used up or condensed, strictly summer items would get mailed back home before we headed out, and everything would get reorganized. 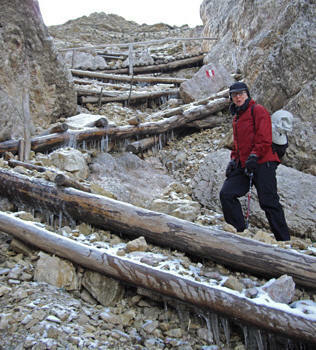 Mulvey hiking up from the lift at Col Raiser near Selva. 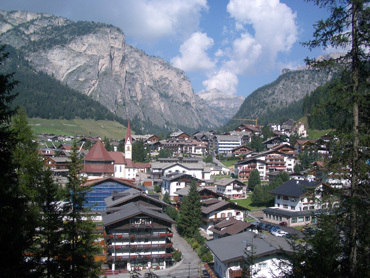 We extended our 2 week stay in Selva by 4 days to show-off some of its pizzazz to Mulvey when he arrived. We then packed up and moved to Corvara in the next valley, Mulvey visiting by bus and we made the hop over the pass by bike. Corvara is currently our second favorite place in the Dolomites and we made several hikes before most of the village closed until the ski season. From Corvara we rode to Cortina over the Passo Valparola and dropped down to Passo Falzarego, my favorite "top 'o the pass" place to be. The cold winds on the way up couldn't chill us on those 10%+ grades but we sprinted to find a natural wind brake for our lunch just off the summit. Luckily for me the sky was a brilliant blue that day and we lingered long at lunch to take it all in--I've yet to tire of the many views from this pass. We climbed to the top of Corvara's Sassongher. From Cortina we rode the short distance to Misurina to once again hike around Drei Zinnen/Tre Cime, which was one of the areas that dazzled us our first time through the Dolomites. On that visit, we were too early, as we were visiting in June; this year it was too late as it was the last week in September. But despite the snow and the cold, Bill managed to squeeze in one last hike for us. Unexpected, like almost a year ago in Sicily, we were selected as hosts by a companion dog for our high-mountain outing. This energetic German Shepherd who apparently lived at one of the main huts at Drei Zinnen had first attached himself to a small group of Americans. Their guide kept telling the dog to go home and as we walked by he decided they weren't much fun. He announced that he would be our guide even though our route wasn't his first choice of ways to go. We were a bit uneasy about the relationship but we quickly accepted each others boundaries. He was clearly Bill's dog though just as clearly thought Bill should have paid better attention in obedience school. "Hütte Hund" ("Hut Hound" in German as we named him) was clear: he was to walk on Bill's right side; Bill was to leave the proper amount of space for him on the path; and Bill should carry his walking stick in his left hand. However Bill kept forgetting the rules. Ever-attentive Hütte Hund on our snowy Drei Zinnen hike. Ever-attentive "Hütte Hund" was undeterred when we hit a long expanse of snow and patiently rested when we ate or fiddled with our gear. Like "Siesta" back in Sicily, our mountain guide was thrilled when our route returned him to his hut. He dashed in the door when we opened it 5 hours later and that was the last we saw of him. He apparently had gotten the companionship his owners weren't available to give that day and we'd enjoyed his gentle presence. 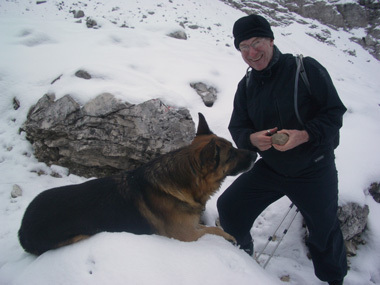 And more that one other hiker was delighted to take photos of Bill and Hütte Hund even after being told he was a borrowed dog. It was the next day at Misurina where we reluctantly once again said "Farewell" to the Dolomites--our favorite place to be. We expectedly got chilled to the bone as we wore out our arms on the steep descent out of the mountains on a clear, cold late September day. The biking and hiking over the next week would be warmer at much lower elevations and no where near as stunning. But we know that the biking and hiking season in these dramatic mountains is short and it was time to head south and towards the sea. The dozens of hours Bill devoted to problems while in the mountains, especially electronics problems, was only partially rewarded. One evening in Cortina we looked at the most recent 150 photos taken with the new camera and the next morning it was in a box on the way to the manufacturer. Bill had followed all of the service rep's suggestions given in a long phone conversation and thought the problems were fixed. It was heartbreaking to have essentially lost the record of all of those days in the mountains. At least the 5 year old camera it was to replace was still working after jamming once months ago. The computer was still working when we headed out, but barely. Two hours to successfully boot-up was the norm and instead of counting the number of crashes in a sitting we monitored how often it could recover on its own in a day. The memory card that our friend Mulvey brought helped a bit as did no longer using the laptop in our laps but on a table top to keep it cooler. The last call to the manufacturer revealed that our motherboard was lodging a defective graphics chip and we again opted to limp along rather than send it in for repair. Working out the wrinkles in Bill's GPS device continued and that was looking like a year-long project. But unlike the computer and the camera, there was a clear improving trend in its performance. It was an unexpectedly huge learning curve to fully use the GPS features in a variety of situations. Luckily Bill's replacement panniers arrived in Selva from Germany in time for our departure from there, which was a huge help. The purchase of a new screw-closure carabineer will keep the altimeter from slipping away again on a hiking outing, eliminating its opportunities for adding unwelcome dramas to our lives. Another group getting ready to go. The image of the seductively slow-moving Costa Brava masses 2 months prior, the folks yielding to their energy conservation survival instincts, leapt into my mind as we arrived in the Dolomites. Here in the eastern Italian Alps the behaviors being modeled were just the opposite of those on Costa Brava: instead of thousands of people reclining in lounge chairs and on beach towels, the crowds on the sidewalks in the mountain villages were charged with a 'get out there and go' energy. Like in the corner of the French Alps we'd recently ridden through, the majority of people in these Alps were obviously in the area for active sports. 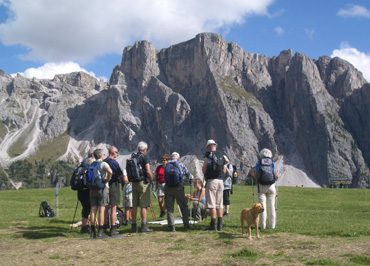 Hiking must be the #1 summer activity in the Dolomites but mountain biking, road biking, and in-the-air sports are popular too. Seemingly everywhere you look there is an invitation to be moving, whether its the evenly graded "passeggiata" strolling paths weaving in, around, and between the villages; the tucked-away tennis courts and swimming pools; the many enticing children's playgrounds; or the abundant supply of outdoor ping pong tables, both public and private. Even though we came to the mountains with the intention of being active, I could still feel the effect on me of other people's behaviors. All of the people in hiking boots with backpacks in place and walking sticks in hand made me restless to get out there too. The pull was just as strong as the "lighten-up and relax" tug we felt at Costa Brava. Both experiences reminded me of a comment I recently read in a health newsletter suggesting that we should surround ourselves with people doing what we want to be doing ourselves. My recent experiences clearly resonated with that advise: enhance your success in achieving your activity goals by being around others with similar goals. Always nice to see other gray-hairs out there. The crowds in the Dolomites were especially motivating because not only were there a high percentage of vigorous people, a lot of them were old, as in older than us. At age 57 we love seeing people 10, 20, and more years older than ourselves on the trails. They were sturdy and surefooted on the loose-rock routes, which was very inspiring. Instead of surrendering to a sedentary lifestyle, these folks had made a commitment to pushing their edge. And just as touching were the many fragile elderly that we saw in the confines of the village paths--people we imagined who had spent decades of summers on these slopes and now settled for the stimulation of the vicarious experience rather than have none at all. Charging up one of the steep slopes engulfing Selva and feeling the sweat again saturating my clothes brought a moment of clarity one day (besides the need to do laundry), which was about the benefits of sports as a source of exercise. In the past I'd always sorted my fitness options into indoor vs outdoor activities but now sport vs non-sport was a newly meaningful perspective. I've always happily done my stretching, yoga, and a little weight lifting indoors but I've never been content with getting my CV exercise, like running, indoors. I learned early on that tread mills, stair steppers, and stationary bikes were only snow-day activities for me as I just couldn't bear the associated confinement as a part of a regular exercise routine. I'd run or cycle in the downpours and in near-freezing conditions rather than exercise indoors. More interesting than a stair-stepper. But now my understanding went a layer deeper: not only was outdoor CV exercise a better fit for my temperment than indoor options, using sports for fitness had additional pay-offs I'd undervalued. I realized that part of the draw for me in charging up steep slopes instead of working out on a stair-stepper was the additional mental stimulation as each foot placement warranted consideration. In contrast, indoor CV activities became a test of will and were often only survived by zoning out. It became clear that part of the pay-off for using sports for CV work-outs was spending more of my life being engaged with what was around me and spending less of my life waiting for a tedious daily interval to pass. Skidding around on loose rock surfaces in Selva also underscored a recently learned lesson, which is that sports challenge more aspects of one's body while getting CV exercise than using machines. Even walking outdoors, the most fundamental sport, brings in more coordination, agility, and balance challenges than walking in a gym or on a machine. Cycling on the road also requires more balance and coordination than a stationary bike as well as building more arm and core strength. As one ages it seems inevitable that we are less animated with our bodies and use fewer muscles than when we were younger and more reckless. Sports seem like an easy way to recruit a bigger range of muscles than one is likely to engage in a gym workout. The many flowers enhanced our outdoor 'gym' experience. This new clarity quickly had me scheming to find new ways to liven up my fitness routine with sports while at home this winter. Walking instead of driving or taking the bus has become my mainstay State-side CV activity because I can be outdoors and time-slice with commuting. But I'll try harder this year to track down a ping-pong table to use once a week and perhaps add swimming to the mix too. Exploring sports options for my CV exercise will be a more intentional focus for my future fitness regimes, both for the mental comfort and for the more varied challenges they bring to my body. We've both been deeply disappointed that the gravity of aging hit us in our mid-50's as we expected to retain our naiveté into our 60's. That unwelcome knowing is a source of almost daily discussion between us in one way or another as we struggle to fortify ourselves for future surprises. In those discussions we keep refining our sense of what the priorities are in aging well and what more we can do to improve our odds of a gracious process. We've both downgraded what we consider a desirable life expectancy and have increased our commitment to "compressed morbidity" (keeping healthy enough to live intensely and check-out fast). Being in the Dolomites reminded us that succumbing to the draw of the many activities in the mountains is a part of our bigger strategy for keeping fit--we need to be where the pull to be active is stronger than the pull to be passive. We've also become clear that fitness is easy part--it only takes discipline; good health is harder to come by as it takes both discipline and luck. We'd expected to finish this piece on Italy after we completed our stay in the country and were in Croatia but our increasingly ailing computer makes it compelling to upload this file ASAP as it may be our last for the season. We expect to be in Trieste on the border with Croatia in a few days and then will meander south along the Adriatic. Shortly before our December 9th return to the States we'll take a ferry to Italy, stash our bikes somewhere, and then take a train to Frankfurt for our flight home.